and the Massage table in Missouri City is structured to hold 500 lbs. 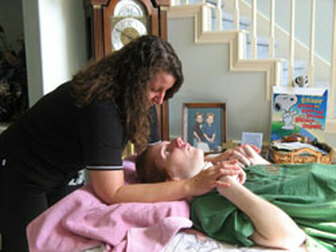 Energetic Healing can be applied if the practitioner so chooses, with the consent of the recipient. Please note that these modalities are not a replacement for a physician's care, nor are any guarantees as to their efficacy implied. If the prospective client is in a wheelchair the handicapped accessibility is limited (table and entries) to Missouri City at this time. Prices are $90 per hour. Medical billing is $25 per quarter hour. Appointments are for a one hour minimum. Locations: Missouri City, near the Galleria, and in the Heights by appointment only.